Do you suffer from recurrent ankle sprains? Or perhaps calf pain, foot pain and knee pain during sports? Even shin splints or tarsal tunnel syndrome? These are very common problems and are not just limited to athletes. If you do have any of these conditions there is a good chance that your posterior tibialis muscle is injured. Here is a simple home procedure that you can do to help correct a posterior tibialis injury and restore strength to your foot, ankle and leg. Robustness in sports requires you to have full functional strength in your foot arches. 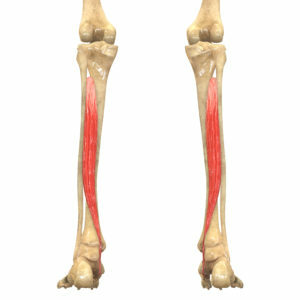 The posterior tibialis muscle is the primary muscle that maintains the integrity of your arch. When it becomes weak and injured your foot will pronate, your knee will rotate inwards, and you lose the natural shock absorbing mechanism that is built into your gait. The result? Recurrent ankle, foot, calf and knee problems that drive you crazy. It doesn’t end there. The biomechanical stress heads up into your hip and back and negatively impact your entire body. This simple trick (contained within the video above) will help a lot, but you do need to consider the WHOLE YOU. The posterior tibialis muscle is related to your adrenal glands. Which means that lifestyle stress from food, exercise and emotions can have a huge bearing in creating and repeating the problem. To get this fixed once and for all it pays to see a qualified Applied Kinesiology Chiropractor who understands how to test and correct the function of this important muscle.